The cupcake is barely a cake. When we think about what “the cake-like” ideal should be, it is something spongy, moist, characterized by excess, collapsing under its own weight of gooey jam, meringue, and cream. It is something sickly and wet that makes your fingers sticky. The cupcake is none of these things; that is, it possesses none of the ideal essence of cakiness. The cupcake is neat, precise, and uniform. It is dry, polite, and low-fat. It is defined by its shape, not its taste, and the cake-cup limits any potential excess. The cupcake is largely aimed at the sort of flat-stomached people who think consuming sweet things is “a bit naughty,” and who won’t even permit themselves to go overboard on their binges. The cupcake is vintagey and twee. It invokes a sense of wholesomeness and nostalgia, albeit for a past never experienced, a more perfect past, just as vintage-style clothing harks back to an idealized image of the 1920s through 60s that never existed. The cupcake appears as a cultural trope alongside the drinking of tea and gin and the lisped strumming of ukuleles. The constellation of cultural tropes that most paradigmatically manifest in the form of the cupcake are associated in particular with infantilization. Of course, looking back to a perfect past that never existed is nothing if not the pained howl of a child who never wanted to be forced to grow up, and the cupcake and its associates market themselves by catering to these never-never-land adults’ tastes. These products, which treat their audience as children, and more specifically the children of the middle classes — perfect special snowflakes full of wide-eyed wonder and possibility — succeed as expressions of a desire on behalf of consumers to always and forever be children, by telling consumers not only that this is OK, but also that it is, to a real degree, possible. It’s an understandable urge, given how terrifying and confusing the world is at present. But it is, of course, the wrong response. Infantilized possibilities stand in a strange relationship to what we might call possibility as such. This is because, to actually be alive and able to take up possibilities in a genuine way means being able to take a critical and thus transformative stance towards one’s environment; it is to really be a fully cognitive adult. Thus, the possibility of always remaining a cognitive child must involve the elision of the appropriate orientation to possibility. Taking up this particular possibility (to remain a child rather than become adult) means shutting the pursuit of all other possibilities down. Hence, we see how the restrictive shape of the cupcake, its cold and uniform neatness, matches up with the infantilizing elements of twee cupcakey tropes: it is only possible, as an adult, to remain a cognitive child if you are a child without sticky fingers, drily conforming to a prescribed set of rules. Something became clear to me in the aftermath of the London riots in 2011, when I saw thousands of people take to the streets with brooms at the instigation of a twitter hashtag (#riotcleanup), and “clean up” the effects of the anger of the rioters, which was already in the process of being dismissed and demonized in the media as opportunistic looting long before the police would find a way to have their murder of Mark Duggan legally declared as its opposite. This realization was that if you wanted to found a fascist reich in Britain today, you could never do so on the basis of any sort of ideology of racial superiority or militaristic imagery or anything of the like. Fascism is, if nothing else, necessarily majoritarian, and nowadays racism is very niche-appeal (just look at how laughable every EDL march is, where the anti-fascists outnumber the alleged fascists by a ratio of more than two to one). But you could get a huge mass of people to participate in a reactionary endeavor if you dressed it up in nice, twee, cupcakey imagery, and persuaded everyone that the brutality of your ideology was in fact a form of niceness. If a fascist reich was to be established anywhere today, I believe it would necessarily have to exchange iron eagles for fluffy kittens, swap jackboots for Converse, and the epic drama of Wagnerian horns for mumbled ditties on ukuleles. Fascism is, properly understood, a certain sort of response to a crisis. It is the reactionary response, as opposed to the radical one. The radical response is to embrace the new possibilities thrown up by the crisis; the reactionary one is to shut these possibilities down. In bourgeois society, thus, fascism will always mean the assertion of middle-class values in the face of a crisis. Because this assertion must mean shutting certain other emerging sets of possibilities down, it will always involve a sort of violence, although this violence can of course be merely passive-aggressive. The 2011 riots were a sort of response to the present global financial crisis, and one more radical than reactionary. They were directionless, yes, but they were the product of a summer of simmering tension produced by the austerity measures the government had imposed as its own reactionary response to the financial crisis, which threatened and still threatens to eliminate the futures of every young person in Britain, especially those from poorer backgrounds — the majority of the rioters. Against the possibilities thrown up by the riots (if nothing else, the possibility of expressing real anger), the participants in #riotcleanup passive-aggressively asserted the very same middle-class values that informed the imposition of austerity. There is no better expression of all this than in the phrase “Keep Calm and Carry On,” which of course adorns everything cupcakey (“Keep Calm and Eat a Cupcake” is almost as prevalent a poster as its ur-meme original). The association is a profound one on many levels. The “Keep Calm” poster was originally designed as a propaganda poster during WW2. It plays on similar appeals to vintage nostalgia that the notion of “having a cupcake” does. It appeals to an idealized past that was never experienced by the longer-afterer. It is also a past that never could have been experienced, since the “Keep Calm” poster was never actually used. It was rediscovered in 2000 and was quickly found to have a vast appeal based largely on how much the slogan cohered with an idealized image of the 1940s. In fact, the poster had never been used because it was considered by those who saw it at the time to be patronizing. Thus the form of the slogan is a perfect expression of the infantilized subject’s orientation towards reality. The same goes for the content. The idea that the best response to any situation is just to accept existing conditions, swallow your anger, swallow your pride, and continue as best you might is an expression of a sort of ideal Britishness, the “stiff upper lip.” But stiff upper lip is, dialectically speaking, nothing more than a form of cowardice; less a level-headed stoicism than a neurotic unwillingness to confront an unjust reality. Many of the participants in #riotcleanup also participated in another riots-era hashtag, #OperationCupOfTea, which implored people not to go out rioting but rather, to stay indoors and “have a nice cup of tea.” These nice white middle-class boys and girls out early clutching brooms were all people whose instinctual orientation towards a hostile world is to cover up, hide, and thus maintain that world in its hostility without confronting it. Images from the #riotcleanup could only seem as if they were from a political rally, for the assertion of this cowardice as a political force. There is now such a critical mass of infantilized subjects in our society that we see their tropes at work everywhere, aggressively. Typically, any middle-class man or woman up to their forties is an infantilized subject nowadays. This means a majority of consumers. Thus every advertising campaign launched by a major corporation and every government public service announcement proudly proclaims that the ideology of cupcake fascism is appealing to them. It is everywhere, from the most trivial examples: a waste bin with a little picture of a sad puppy on it and the line “It’s not my fault my mess doesn’t get cleaned up,” or a napkin dispenser that says on it, “Please Only Take One of Me,” (this latter is, incidentally, something I once saw in the House of Commons cafeteria; even those in positions of what in some lights can look like actual power are in the grip of infantilization). All the way to massive, blockbuster instances of the phenomenon such as the recent Coca-Cola #ReasonsToBelieve campaign which was full of such obviously insidious expressions of cupcakey positivity as “For every tank being built . . . there are thousands of cakes being baked,” and “for every red card given . . . there are 12 celebratory hugs.” The advert also features a scene in which a man high fives a cat. All of this has an effect on our culture that we can understand as being a sort of gentrification. The cupcake has always itself been a gentrifying force: after all, the “pop-up cupcake shop” is the paradigmatic pop-up shop. But what all these things do is assert the infantilized values of an increasingly infantilized middle-class world on general society. This is how the passive-aggressive violence of the infantilized twee fascist manifests itself: moving across the world with a cupcake as a cowcatcher, shunting out everything that does not correspond to the values manifested within it; a much more effective way of sweeping up the sort of (poor, working-class, black) forces that informed the 2011 London riots than any broom. Not uncoincidentally, #ReasonsToBelieve included footage of said riots labeled as an “expression of hatred,” to be contrasted with the wave of love apparently unleashed by a long-overdue government recognition of gay unions. 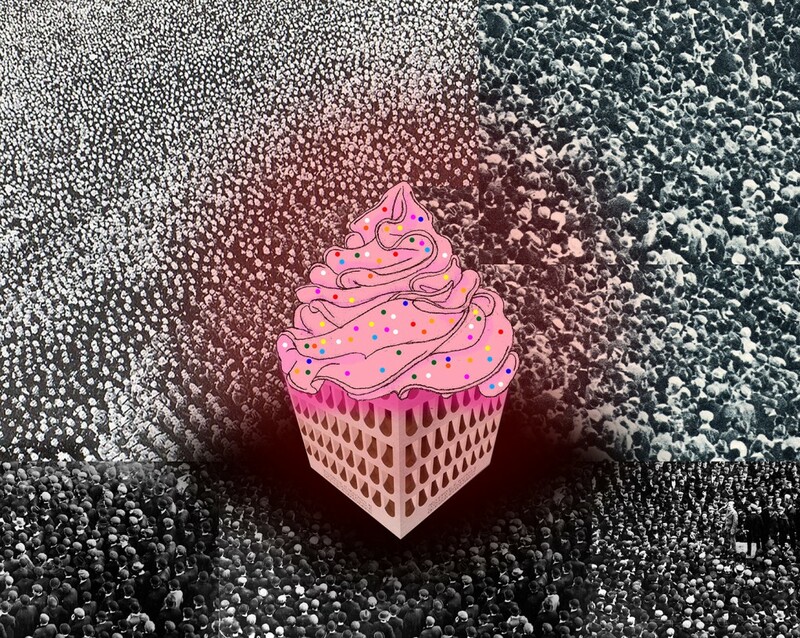 It is in some sense a contradiction to think of cupcake fascism as both an aggressively assertive movement violently imposing a particular set of bourgeois values on society and also the expression of a desire on the behalf of an infantilized populace to “go into hiding” from the world. But these two things only appear in conflict pending the assumption of the right perspective on the matter. Cupcake fascism asserts itself violently through something the infantilized subject holds deeply as an ideal. This ideal is niceness. On the one hand, niceness is just what the infantilized subject thinks is lacking from the world she is hiding from. In the first instance, the problem these people had with the London rioters was that they were not being nice enough. If the rioters had just sat down with a cup of tea and talked their problems through with their oppressors, the infantilized subject thinks, then there would have been no need to resort to damaging private property. The sort of niceness I mean here is precisely that embodied in the figure of the cupcake: neat and predictable, undangerous and healthy, redolent of a perfect past that never was. In a nicer world, everything would work as it should, the good and hard-working would get exactly what they deserve, and everyone would behave properly. This last aspect of the infantilized subject’s vision of a “nicer” world is the most telling, for on the other hand, niceness is also an injunction from above. “Just be nice!” is something a parent or teacher would tell a wayward child. The injunction to behave properly, to smile and get on with it, is precisely a way of shutting down any form of social resistance. People are conditioned to be nice from the very start of school, and it is the effect of an infantilizing gentrification that this injunction is further spread by those who have most effectively internalized it. These people are the middle classes. To be nice, to “behave properly,” is simply to behave like an infantilized middle-class subject. Thus every marketing campaign or government public service announcement that passive-aggressively preaches niceness is really a violent enforcement of reactionary values that serves to preserve a crisis-stricken status quo. If we see the paradigmatic mechanisms of social oppression operative today in the form of a cupcake, then the clue to the overthrowing of these mechanisms exists also in cake, albeit of an entirely different kind. It is precisely in the truly cake-like, the spongy and the moist and the excessive and the unhealthy. Against the austerity of the cupcake-form, we need to recapture, in our social reality, a sort of joy: the joy of being open to genuinely alternative possibilities. Another way of looking comes when we examine the way in which an infantilized adult is precisely not a child. A child cannot remain a child; a child is on the way to becoming an adult. When a child does child-like things, it is in order to explore the world in a way that equips it to one day confront that world for what it is, as what the child will be as an individual. So the child is open to possibility. And the child always has sticky fingers, and jam around its lips, and does things that no one would ever think are in its best interests. The infantilized adult, by contrast, because it is neurotically trying to remain a child, must shut down possibilities. It cannot engage with the world in a way characterized by the joy of possibility. In order to actually live the possibility of remaining a child, the world that the infantilized adult engages with must always remain “safe” and coldly uniform: the cupcake as opposed to the messy and collapsing sponge-cake. Thus, if we want to be less infantilized, we have to behave more like children. If this seems like a paradox, it must mean that you are just not thinking about the matter dialectically enough.